Demand for U.S. manufactured durable goods tumbled more than expected in August, held back by steep drops in airplanes and cars. Durable-goods orders declined by 1.3% to a seasonally adjusted $191.17 billion, the Commerce Department said Friday. This is the biggest drop since August 2009. 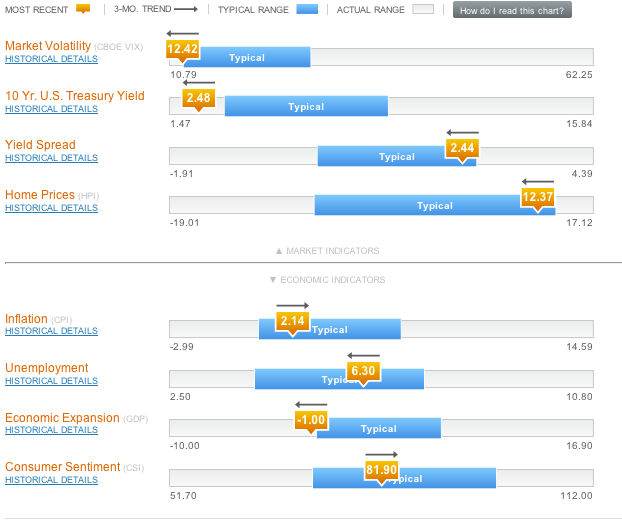 Economists surveyed by Dow Jones Newswires expected a 1.0% decline. Friday’s report was mixed, as there were gains in machinery, computers and fabricated metal products. Also, a barometer of capital spending by businesses rose; orders for nondefense capital goods excluding aircraft increased by 4.1%. Still, overall transportation equipment orders dropped 10.3% in August — restrained by a 40.3% decline in orders for nondefense aircraft and parts. 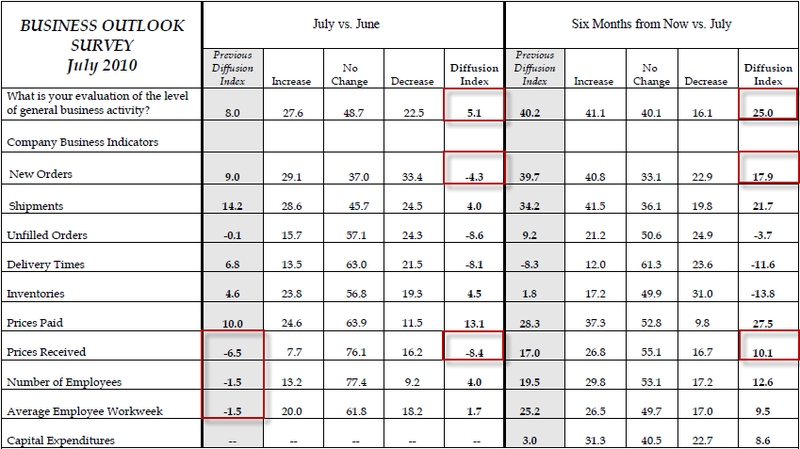 Motor vehicles and parts were also down, falling 4.4%. 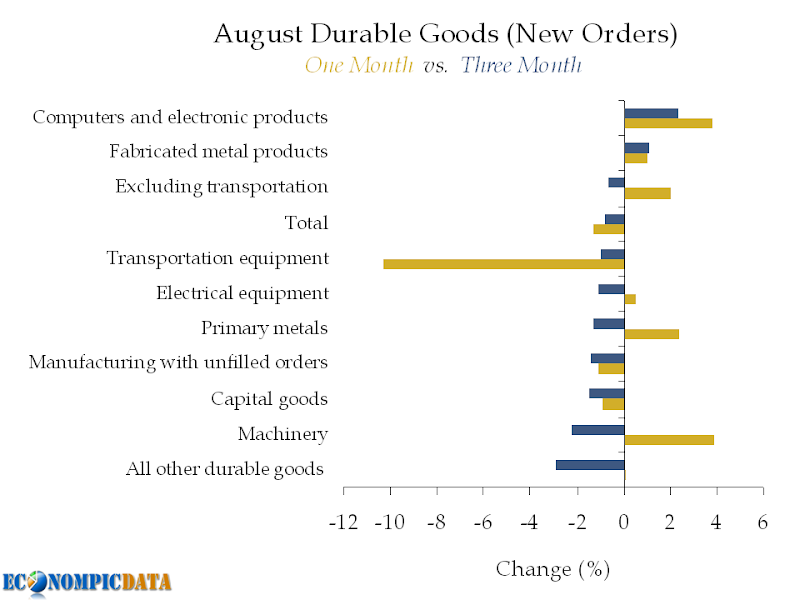 August was not as bad as the headline figure would indicate… without non-defense aircraft, durable goods were up 0.6% and without all transportation, durable goods were up 2%. 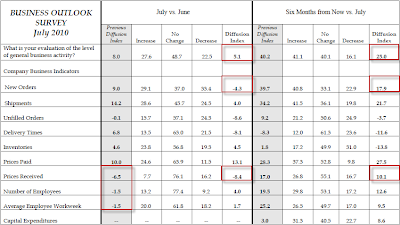 HOWEVER, the overall trend is ugly with the three month change in durable goods new orders down -0.8% and only two categories showing growth (electronics [thanks Apple!] and fabricated metals). New orders for manufactured durable goods in January increased $5.2 billion or 3.0 percent to $175.7 billion, the U.S. Census Bureau announced today. 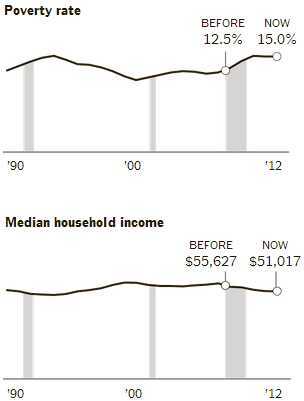 This was the second consecutive monthly increase and followed a 1.9 percent December increase. Excluding transportation, new orders decreased 0.6 percent. Excluding defense, new orders increased 1.6 percent. Internals are not all that good either. Inventory on computers and electronics are being rapidly depleted – manufacturers (despite the BS claims of the media) are NOT replenishing stock. Take the so-called "pumping" and stuff it. 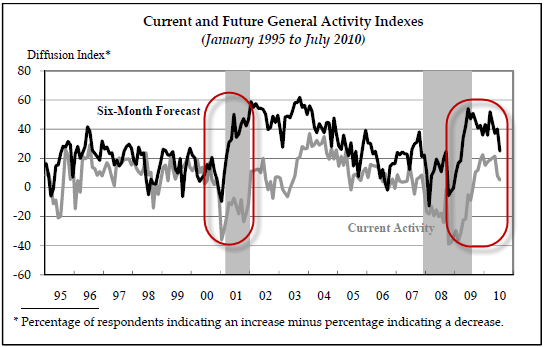 Not-seasonally-adjusted new orders and shipments are down significantly. Since most Christmas "stuff" is ordered and shipped in advance of December, this isn’t very positive at all. Most important in the "new orders" column is the decrease in computers and electronic components. Remember, we keep hearing how wonderful it has been in earnings reports. Well, if that’s so, then explain the decrease from 31,577 to 23,146 in new orders month/over/month – that is almost a THIRTY PERCENT decrease! It’s across the board too – not just computers, but also the subindex for communications equipment. NOT GOOD. This is a leading indicator for hiring activity folks. I’ve harped on it before and will keep doing so. New employees = more computers and cell phones. If you’re not seeing it there (and you’re not) then the entire premise of "a recovering employment picture" is absolute crap. Best-a-luck with that "recovery" thesis folks. Durable Goods “Mistake” Or FRAUD? Durable Goods "Mistake" Or FRAUD? On January 5th the durables report for November was ‘released’. It showed a 0.2% increase. I didn’t write on it at the time, as it didn’t appear to be particularly consequential. 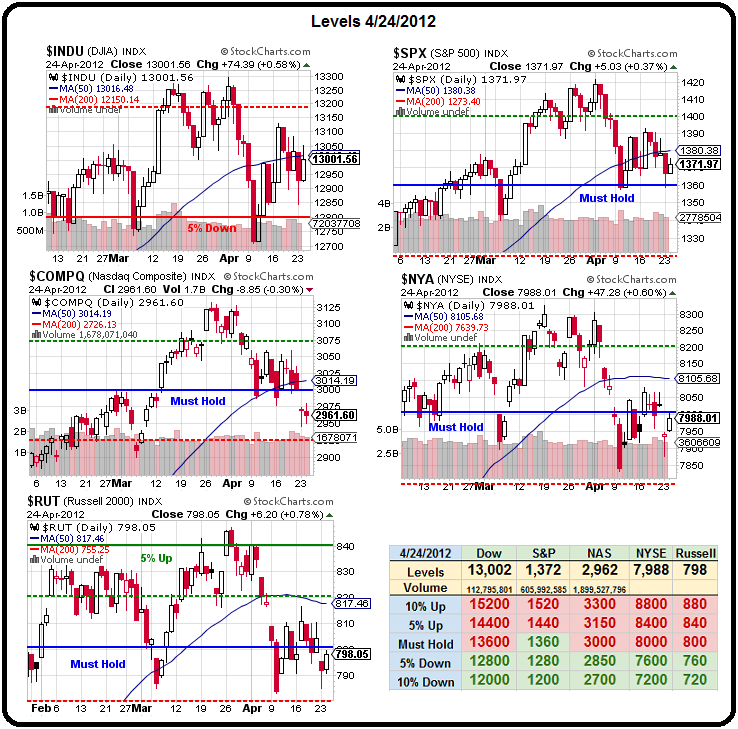 The report, of course, came in the middle of the first-week January market rally. But now, in the dark of night, the number has been revised – to a decrease of 0.7%. The reason is a claimed "statistical error." This, by the way, should have been obvious from the retail sales report, which I did write on. 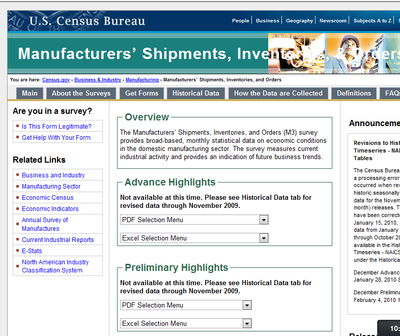 Here’s the ugly – the Census’ link to the report is now listed as missing (that is, intentionally removed!) and what’s worse the link they refer you to, the "Historical M3 Releases" does not have the corrected November data – it only has releases through October on it. That is, November’s report has disappeared. No, the "historical" tab doesn’t have it either. Attempting to retrieve it off the link in Google’s search returns a "not currently available, see historical" message – but it’s not there. You would think that such an "error" would result in an immediate press release by Census identifying the cause of the error and a corrected report, along with CNBS and the rest of "ToutTV" talking about how this "mistake" happened and alerting investors to the fact that they had made decisions based on "mistaken" information and in fact durables had suffered a second sequential decline. Are we now down to rank fraud in "data releases" from our government, revised in the dark of night without public notice or press release, with the agencies claiming "statistical error"? Folks, honest errors are immediately admitted to when discovered and disseminated to all of the people who the government or agency knows relies on these figures for economic decisions. But when "errors" are less than honest the person or agency committing them attempts to hide the evidence instead of admitting to and publicly exposing their mistake. 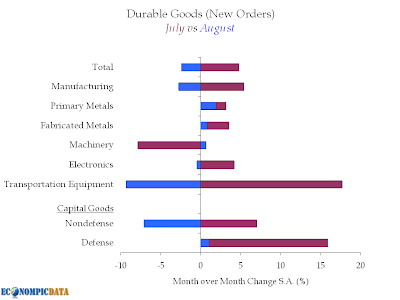 We noted last month that the jump in July durable goods came from a spike in commercial plane purchases, thus no surprise here that durable goods came full circle. Thus our surprise that "real" reporters and/or "real" analysts were "surprised". New orders for long-lasting U.S. manufactured goods fell unexpectedly in August, dropping by their biggest margin in seven months, following a plunge in commercial aircraft orders, the government reported on Friday. The Commerce Department said durable goods orders tumbled 2.4 percent, the largest decline since January, after rising by a revised 4.8 percent in July. Analysts polled by Reuters forecast orders rising 0.5 percent in August. Compared with the same period last year, new orders were down 24.9 percent.